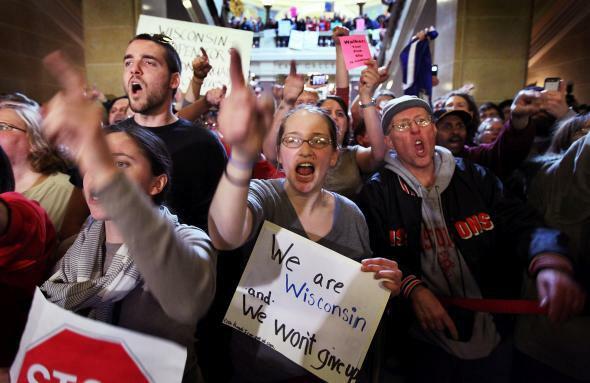 Ah, memories: Protestors shout outside the office of Wisconsin Gov. Scott Walker as he signs a copy of the budget repair bill on March 11, 2011, in Madison, Wisconsin. Walker has become the archenemy of the AFL-CIO and other union organizations in recent years. Since being elected in 2010, he has rarely missed an opportunity to try to dismantle organized labor in the Badger State. Walker eliminated collective bargaining rights for most public employees in 2011—an act that prompted massive protests at the state capitol and forced a recall election the following year. Earlier this year Walker handed unions another stinging defeat when he signed “right-to-work” legislation into law that prevents unions from requiring workers in their industries to pay dues or fees (in return for benefitting from the union’s collective bargaining power). Walker’s victories—and the unions’ losses—were all the more stunning because of the state’s general liberal leanings, along with the fact that Wisconsin was the first in the nation to provide its public employees with collective bargaining rights.